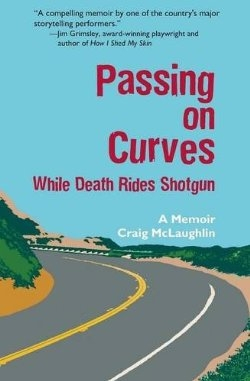 Some of the experiences Craig McLaughlin writes about in Passing on Curves could provide enough material for an entire book. He spent much of his childhood on a farm where his mother’s boyfriend collected jaguars, tigers, monkeys, and other exotic animals, despite an inability to care for them. McLaughlin, a hemophiliac since birth, contracted HIV from a blood transfusion, and his health has been a lifelong struggle. His stories about those two subjects are the best parts of Passing on Curves, which collects essays McLaughlin used for stage performances. Because of the essays’ original spoken-word purpose and the book’s short length, the best pieces feel like they can use expansion, as the book format would allow even more detail, and sometimes the more everyday stories feel slight when compared to those about the author’s singular experiences. The early stories about the makeshift zoo are particularly memorable, with a real sadness to how a hot-tempered father figure could prove scarier than a loose jaguar. The book could use more of these, because McLaughlin relates them so honestly, with the right mix of emotions. What’s here is good stuff, and unique.